It’s all over now. Holiday burgers, dogs and brats eaten, along with the fresh corn, sliced tomatoes and watermelon. And maybe even our first s’mores of the season. Along much of the eastern seaboard, it was very rainy, with a lot of Holiday fun cancelled or moved indoors. But summer is finally here, even though it’s not official for another three weeks. Our last Nugget previewed Memorial Day. As promised we kept looking for Memorial Day emails, discovering that the real email push for this Holiday occurred since our first report. Much of that activity occurred on Memorial Day itself. The left hand table below [top] shows activity we’d detected and shared in our initial report. The right hand table [bottom] shows all related activity in the nine days since. In just those nine days, over 9,000 additional Memorial Day themed emails have deployed, 28% more email volume than for the comparable period last year. But year-over-year read rate performance deteriorated. Of those 9,000 emails, 13% have a read rate exceeding 20%, versus 14% of the comparable volume in 2015. The full-line retail titans did stir a bit, but not all of them. Walmart mailed 31 Memorial Day themed campaigns; Macy’s and Amazon 11 each; Kohl’s only 2; and Target none. Of the Memorial Day emails deploying after May 21, well over 20% deployed on Memorial Day itself, somewhat less in percentage terms than last year. Of those, a lower percentage drove read rates exceeding 20% than the comparable period last year. In neither year did emails deployed on Memorial Day drive as big a share of high-performing emails as we saw for the overall periods. Interestingly, this same-day volume actually built steadily throughout the day, with the total growing even into the late afternoon. Of the related email campaigns deploying on Memorial Day itself, only 66% were visible by noon (ET), and 86% by 3 PM. 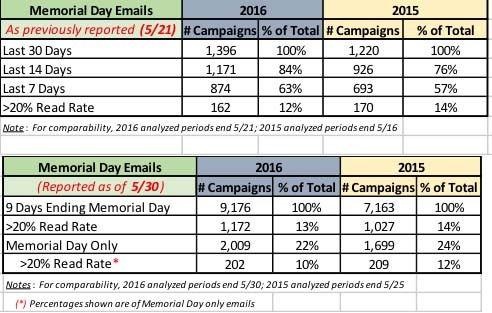 You can see examples below of top-performing, higher-volume Memorial Day emails sent since our last report. Of the eight emails shown, all but one are explicitly price-promotional, and three of those offer very aggressive percent discounts. Two others quote a specific price or dollar savings. Amazon owns the top read rate performer, as well as one other strong performance example. Both of those subject lines reference product. The runner-up, Harbor Freight, also references product in that email’s subject line. Enjoy your summer. We have only five more weeks until July 4th! This entry was posted in Email Marketing and tagged 2016 email campaigns, eDataSource, Memorial Day on June 3, 2016 by Amy Mullen.